Plato’s most influential text gets a going-over in the latest addition to Atlantic’s Books That Changed the World series. Blackburn (Philosophy/Cambridge; Lust, 2004, etc.) summarizes the Greek philosopher’s principal arguments and considers their contemporary relevance. He begins by undercutting Alfred North Whitehead’s famous statement that all European philosophy is a series of footnotes to Plato, then moves to clarify the distinction between the “worldly” Aristotelian view and the “other-worldly” Platonic value system. 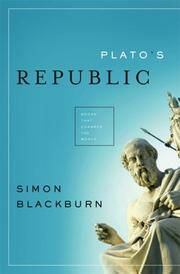 These and other introductory matters (including some historical background) out of the way, the author launches into his exegesis, examining closely Plato’s views on might and right, on ruling elites, reason and passion, knowledge and belief. After a chapter on Republic’s best-known portion, the Myth of the Cave, Blackburn devotes his most compelling and significant pages to examining how three traditions have employed this famous allegory. Christians folded its ideas into their own theology and expelled Plato. Poets like Wordsworth and Shelley saw the allegory’s enormous metaphorical and spiritual richness. Mathematicians and scientists were perhaps those whom Plato had in mind all along, for Blackburn notes that they alone understand “the unchanging within the changing” that lies at the heart of the parable. The author reluctantly leaves the cave and looks at Plato’s “descending staircase” of political systems, with the philosopher-kings occupying the summit and absolute dictators lurking in the pits. Here and throughout Blackburn is forthright about his own political views. He repeatedly bashes Bush, Blair and neo-conservatives; he grieves that we are in the grip of a new oligarchy of the wealthy, who control the media and thus the ballot box. His final chapters deal with Plato’s silly dismissal of painters and poets and with the “charming, and poetic” Farewell Myth of Er. Rigorous and humble, admiring and dismissive—a clear and accessible introduction to philosophy’s first superstar.